Suitable for both single faced & double faced pallet. 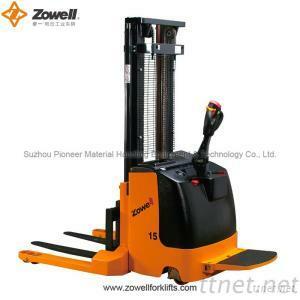 Germany Mannstaedt forklift profile for mast building. Battery side extraction: the side gate and the battery cover are openable. Battery can be removed from the side, making it very convenient to replace and maintain batteries. Emergency reversing device in the handle provides improved operating safety. Braking applied with handle upright and horizontal position, increasing the safety of the truck. Built-in pressure relief valve protects the trucks from overloads, increases the reliability.